The new Water Filtration Station: AquaAXIS is the most comprehensive off-grid plumbing and filtration system currently on the market. Connect one end to your storage tank and the other to your home's internal plumbing and you're good to go - completely pressurized, filtered, and distributed instantly including drinking water. The AquaAXIS is designed specifically to filter rainwater through a segmented sequence of reverse osmosis, increasing the life of each mechanical component while ensuring only the relevant filters are used at any time. Not only is this the perfect solution for off-grid houses, it’s also great for RV’s, tiny homes, wells, campers, and more. There is only one input into the AquaAXIS, a 3/4″ MIP or 3/4″ MHS thread which connects to your green water, or raw unfiltered water. It is impartial to the kind of rainwater catchment and storage setup you’ve established, simply connect the green water storage using whatever method your prefer. 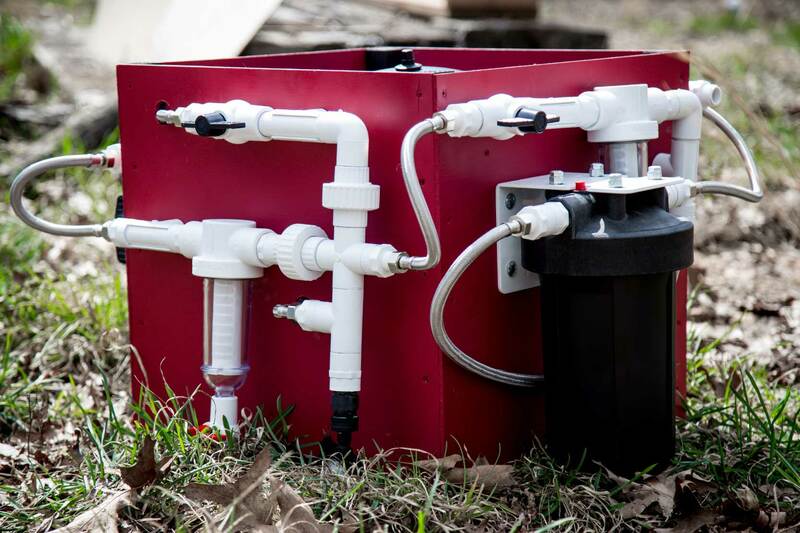 There are two 3/4″ outputs leaving the AquaAXIS, one to connect to your home’s internal plumbing and the other specifically for drinking water. It is not rare to see the water grid polluted with toxic chemicals and trace elements including chlorine, total trihalomethane, fluoride, lead, mercury, and more. Please send water samples off to a lab for thorough testing before integrating your local grid water with the AquaAXIS. The reverse osmosis methods utilized by our Water Filtration Stations do NOT filter out many of these common chemicals or toxins. The AquaAXIS is designed specifically for pure, soft rainwater. Ozarkpermaculture.net has made it easy for customers to have a functioning off-grid water system. However, it is the responsibility of the consumer to choose the correct water treatment system for their unique situation. Ozarkpermaculture.net may offer common uses for off-grid water treatment technology and may provide common solutions to common water problems. However, Ozarkpermaculture.net does not recommend or suggest a particular water treatment system for a particular application because Ozarkpermaculture.net is not able to have all necessary information regarding a particular application. For example, Ozarkpermaculture.net does not know which contaminants are in the customer's water, nor does it have information on all variables surrounding their unique situation. Ozarkpermaculture.net is not subject to product liability, the manufacturer alone is liable for damages resulting from products that Ozarkpermaculture.net uses or sells.